God showed me a quick picture of a beautiful flower. It was a rose; deep in colour and texture, exquisitely fragrant and perfect in form. We can draw many messages from the life of the rose up to this point. It has been grown with care, fertilised, nurtured, pests have been killed, diseases dealt with, it has been pruned hard and this has gone on year after year.We choose a perfect, beautiful rose, we put it in a vase, we enjoy its beauty and aroma in the room and hope that it will last long as it brings pleasure to the eyes and brightens the room. We may cut the rose from the bush ourselves or we may give or receive them as a gift. No matter how beautiful they are the same is true of every one; they have been cut from the bush at the height of their beauty. When we receive the rose and put it in a vase at best it may last a few weeks, then sadly it dies and we throw it away. Some rose petals are dried for pot pourri and some for floral arrangements or bouquets, these help us to remember the former beauty and fragrance but these can never compare with that of the height of the roses life. Some of the finest roses are cut down in their prime. Their petals are crushed to form the basis of wonderful perfumes. When we wear these perfumes we can once again enjoy the rose. Our minds eye recalls a fresh picture of its beauty; the aroma of it awakens our sense of smell. In essence the rose hasn’t died, but lived on, to continue to bring pleasure and beauty and testify of itself. We are not unlike the rose. When we face trials and problems that come we feel as though we have been cut. We are the rose that is given, sacrificed. The rose that is placed in the vase. Others can admire and enjoy the beauty and fragrance that God has given and formed in us. Like the rose we all know that we are not immortal but yet with Jesus we are eternal. Then there is the rose that is cut down and that has its petals crushed, no one enjoys the beauty of it, but though it dies yet it shall live on. The crushing process is a lone, private thing. When we are crushed and we can see and show God to be faithful, strong and glorify Him and point others toward Him, we spread the fragrance around. Others are blessed, changed and enhanced by the things that have crushed us and are encouraged that their ‘crushing’s’ will too, give off their own fragrance to yet others. 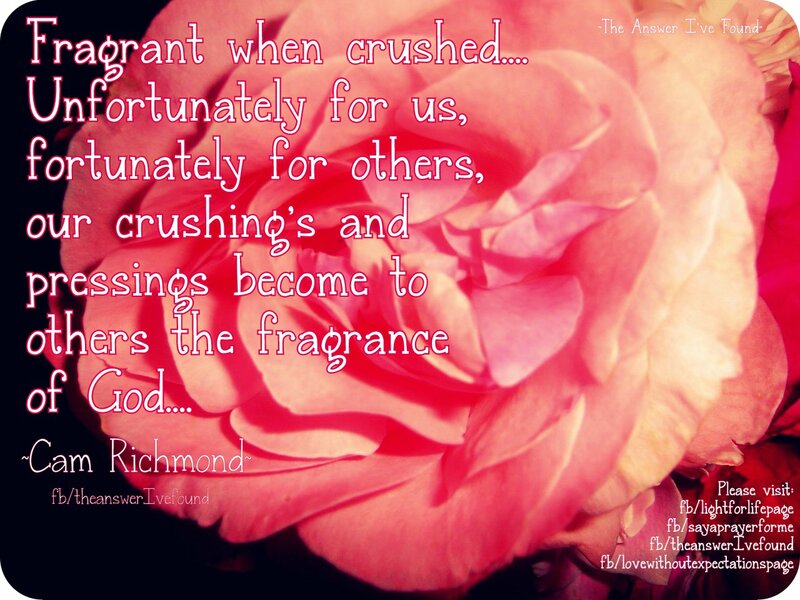 Our crushing’s and pressings become the fragrance of God. This is how God expresses His presence with His people in this world –the easiness of their access to him. Also the beauty and sweetness which they find in Him. The Rose: For beauty and fragrance, the chief of the flowers. The rose of Sharon, where the best roses grew. It was a rose of the field not shut up in a locked garden. The Lily: For whiteness and for sweetness. The lily of the valleys, or the low places. To those that are in the valley He is the Lily of the valleys. This details the ultimate crushing. The Rose of Sharon was cut down at His height, He was wounded and bruised. He is always our example and goes ahead of us. He was crushed for us, not just as an example to us. “Blessed be the God and Father of our Lord Jesus Christ, the Father of mercies and God of all comfort, who comforts us in all our tribulations, that we may be able to comfort those who are in any trouble, with the comfort with which we ourselves are comforted by God. For as the sufferings of Christ abound in us, so our consolation also abounds through Christ. Now if we are afflicted, it is for your consolation and salvation, which is effective for enduring the same sufferings, which we also, suffer. Or if we are comforted, it is for your consolation and salvation. For we do not want you to be ignorant, brethren, of our trouble, which came to us in Asia: that we were burdened beyond measure, above strength, so that we despaired even of life. beauty, Christianity, crushed, fragrant, growth, Jesus, Lily of the Valley, pruning, Sharon Rose, struggles, tough times. Bookmark. profound and fresh, thanks for sharing!